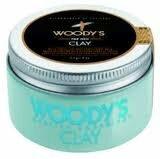 Woody’s Clay Pomade is able to hold the hair in place without giving shining gel look. The pomade gives the matte finish look. The formula of pomade keeps the hairstyle intact for longer time. It would be the ultimate hair styling product for men, which you can buy from Amazon online shopping in Pakistan. Delivers strong, exceptional hold with natural flexibility and no "crunch"